Now that RailsConf 08 is underway, let us help celebrate the event by showcasing some cool Rails applications. Throw in the word 'open source' and we've got a hit in our hands. Fortunately, you don't need to be looking at several places to get a load of these. 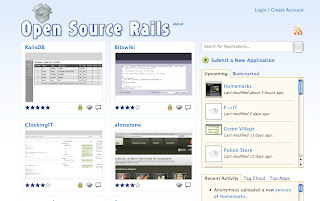 Just go to Open Source Rails where you will find a variety of applications for a variety of needs. Take some time to search the site and I'm sure there will be something worth your fancy whether for personal or for business. In case you're interested in Tracks, you're in luck as Mor.ph has already hosted it - free for you to use when you sign-up.